SECRETFORTS: Debatable: 3Sixteens, Six Months in. 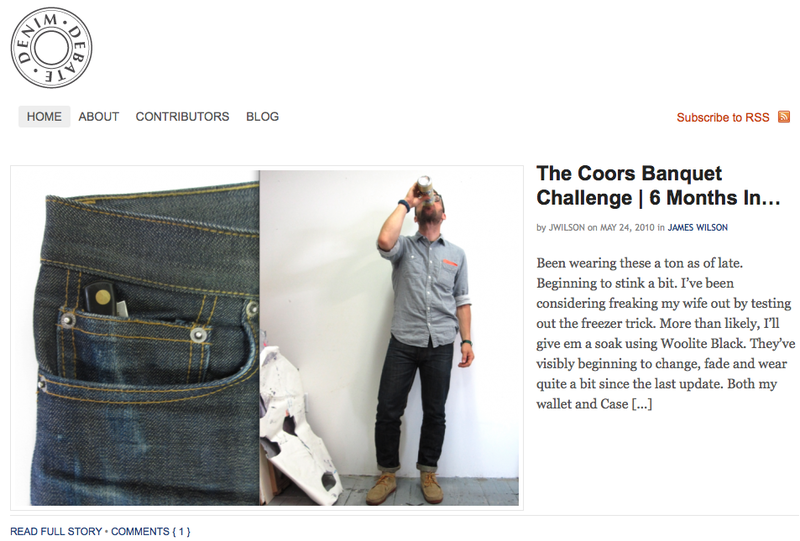 Up over at Denim Debate now is the most recent installment of this year-long saga of a man and his jeans. Or is it a chapter in the epic tale of men and their jeans? Either way, get over THERE and check it out how my 3Sixteen's hold up during my very specifically calibrated 24 oz. Banquet challenge. I've been following the blog for some time now and this is my first comment. I can honestly feel the authenticity and genuine nature in the look, style and feel in what you do and what you post, it's very refreshing and a great read. Just wanted to drop you a line, say thanks and show some support. I have been admiring your blog now for some time, since being introduced through acontinouslean. The coloring of these denims and the subtle, but definate wear, reminds me of a recent experiment that I also conducted with my APC new standard denims. I cant help but visualise Jack Kerouac in these true blue beautys. Is the chambray shirt made by sugar cane or buzz rickson? Loving the working man beard, by the way. 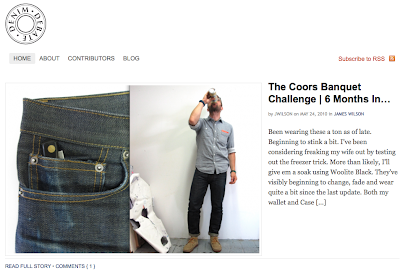 Are you sure only one can of Coors was used during that shoot? Looking at all the little thumbnails, it almost suggests otherwise! nice jeans. where's the shirt from? Thomas, thanks so much. Too kind. Always nice to hear. Especially from way down under. Shirt is J Crew from last Fall. double faced utility shirt. Perhaps a longshoreman or carpenter should take the challenge. do the 3sixteens stretch? I bought a pair size 33 and they fit looser than new standards did which I bought a size 32 in. What is your normal waist size? Andrew suggested I size down. I'm in a 29. I am generally a 30 or 31. And yes, they do stretch.